expired Groupon local deals WNY Deals Save $10 on most Groupons (thru 11/18!) including Scotch 'n Sirloin, Dave & Busters, Mike's Subs, and more! 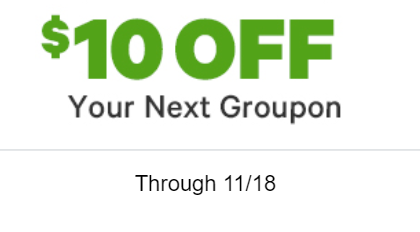 Save $10 on most Groupons (thru 11/18!) including Scotch 'n Sirloin, Dave & Busters, Mike's Subs, and more! Though today only, November 18th, you can save $10 off most any Groupon priced $11 or more (some offers are excluded) using promo code BONUS10 at checkout! That makes some vouchers just a few bucks for significant savings! $8 for $30 Worth of Steakhouse Dinner for Two or More at Scotch 'n Sirloin with promo code BONUS10 - selling fast! As a side note I LOVE this place!!! Click here if interested in redeeming this offer! Hurry though as offer ends 11.18.18!